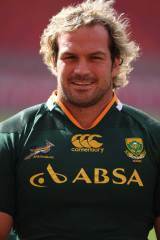 Jannie du Plessis is the older brother of Bismarck and started his career at the Free State Cheetahs. After making his debut for the Boks in the 2007 Tri-Nations, du Plessis was a late call up to the World Cup squad the same year in place of the injured BJ Botha. He was thrust straight into the first-team squad and started their quarter-final in place of the injured CJ Van der Linde. And a week after the victorious World Cup final, Jannie turned out for the Cheetahs in their 2007 Currie Cup final. He decided to move to the Sharks in time for the 2008 season and took the Currie Cup in 2010 with the Natal side. And du Plessis will hope to play a key part in the Boks squad for the 2011 World Cup having been named in their 30-man squad for the tournament.